I’ve applied for the lottery to enter the NYC marathon on November 7, 2010. For non-qualified runners, there is a lottery for entrance. This is a huge race, http://en.wikipedia.org/wiki/New_York_Marathon says that there were 43,000+ finishers in the 2009 race. To qualify for guaranteed entry, I would need to have a certified marathon finish time of 3:30 or faster. That’s not going to happen – LOL!. The fee to enter the lottery is only $11, and if I fail the lottery 3 years in a row, I get in. Therefore, if I persist with lottery applications, I’ll be able to run this event no later than November 2013. Lottery entry deadline is March 15. What are the odds? In 2008, 57,000 people entered the lottery, but only 5,600 were accepted. Similarly, in 2009 6,500 runners from more than 40,000 (were) …..selected. 2010 Lottery results will be announced before the end of March which gives plenty of time to train. again. I set my alarm for 2:50am, picked up Seth at 3:15 and we drove to Tampa for the Gasparilla distance classic. Seth and two other friends were running the marathon. I signed up for the half, which started and ran alongside the marathoners for about 8 miles. It was ultimately my slowest half marathon at 2:32, and I’m sure it had nothing to do with the screwdriver I consumed at mile 5 thanks to merrymakers with an unofficial aid station along the route. See my photos on this public facebook site. Mission accomplished. Last January I set a goal to complete the 2010 Disney marathon, and in May I outlined a training regimen to lead me to the 1/10/10 event. I finished yesterday with a time of 5:20. I placed 9,474th out of almost 17,000 finishers. They say above all else, don’t try anything new during a marathon. But I did three things that I never did in training, and which were instrumental to my success. I walked. I reduced my pace by walking about 10 minutes every hour in order to reserve resources for the last 6 miles. I gobbled some Tylenol from a medical station half way through the race. They were handing them out like candy. I stuffed my face before and throughout the race. The consequence was that my pace picked up throughout the race, and my last miles were the fastest of all. This is called having negative splits. I did nothing but pass people in the last 4 miles. I was giddy when I crossed the finish line. I finished the 26.2 miles feeling stronger than I did in any of my long training runs. My error in training was that I never varied my average pacing as my distances increased. I almost always run a 10.5-11.0 minute mile, even in 5k’s. I thought I’d be able to maintain this for the 26.2 marathon and finish in less than 5 hours. What happened in training is that by running this overall pace I hit a wall at about 20 miles. I only learned in the week prior to the marathon that this is called ‘bonking‘, or completely expending all physical resources. I also neglected to eat and keep my energy levels up for the 3+ hour runs. I’d carry an orange, and gator aid, but that was about it. So, I’d never completed more than 21 miles prior to this event, I was fighting a nasty head cold, and the forecast was for sub-freezing temperatures. It was enough to make me toss and turn anxiously all night prior to the race. 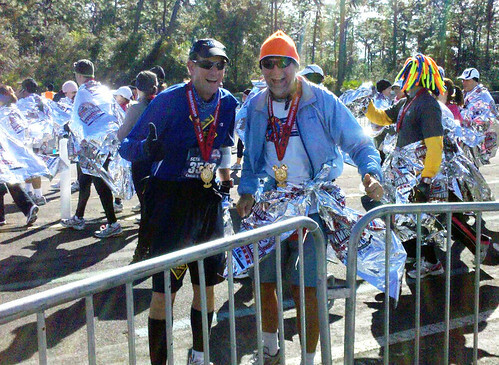 For race day, I had the enthusiastic assistance of veteran Disney marathoner and friend Seth Elsheimer, who volunteered to transport and get me to the starting line. Seth picked me up at 4am, negotiated the traffic backups, and got us to a favorable parking space. Still we had almost a mile to walk through check in and get to the starting corrals. Seth arrived there exactly at his 5:40 start time. I crossed the starting line 22 minutes later at 6:02am. It WAS freezing cold, about 28 degrees. Runners dressed in layers and discarded things along the course. While running, I shed sweat pants, a long sleeved shirt, and a hefty garbage bag. Another pair of pants and socks I left at the starting line. I saw some nice things tossed aside: technical gloves, parkas, windbreakers. All the discards were collected for charity by Disney. I was fine with the cold. A cheap woven pair of disposable gloves ($3 from the runners expo) served me well. Once my core temperature gets elevated, it feels maybe 25 degrees warmer to me. Nonetheless, at the water stops the powerade was slushy and the water in paper cups was iced over. There was some hazardous black ice in shady areas of the course. My mp3 player was not necessary, I used it for less than half the run. There was lots of entertainment, Disney characters, and ambient music along the course, especially when weaving through the parks themselves. In the middle of one long empty road, I came across Jeremy James, of Toxic Audio and The Caroling Company, singing a Beatles song karaoke-style. The run itself was quite fun going through the parks: Epcot, Magic Kingdom, Animal Kingdom and Disney Studios. We jogged through public byways and backstage alleys. There were Disney characters everywhere, and many runners stopping to line up for photos. By midmorning, there were park guests cheering us from behind traffic cones. Between the parks were long stretches; some quiet back roads, and one brutal 3 or 4 miles along a noisy highway which was totally exposed to the 15-20 mile winds. And the temperature never did get out of the 30’s. At about mile 20, there was a deliberate turnaround that allowed runners to watch for and greet fellow athletes passing the other direction for almost a mile. Seth was ahead of me and we hailed each other as we passed. Linda and Gina drove down to see the finish, and there was a big area in the last .2 miles crammed with bleachers, families and friends. Gina reports that she saw me cross the finish line and get my medal with a huge smile on my face. They both doubletimed around the stands to the chutes and called out and got my attention as I was walking it out. Gina forced her way to the front and gave me a hug over the barricade. I stopped at the ‘perfect 17’ check in to wait for Seth, and when he showed up, Gina snapped some cell photos. I do regret that I couldn’t find coworker Kevin Yee who was volunteering at the finish line. I still had to check out and recover some belongings, but eventually reunited with family, and we made our way to the car. As I slid into the passenger seat and groaned at the discomfort, daughter grinned and said “oh, the first bending of the knees!” 4-year crew athlete Gina knows this one well. I’ll do this again, maybe not the Disney, but all the work and training was totally worthwhile. I’m in better shape than I’ve ever been in my life, and I can eat almost anything I want. I’ll really do a better more realistic job of training next time. I bet I can do a sub-5 hour marathon. I hope to keep up with some modest runs (8-12 miles) and do some half marathons on a regular basis. Thanks again to all my supporters, coworkers and friends for encouragement and advice along the way. Now I need to set another goal. Its week zero, the Disney marathon is this Sunday. I mostly made my training objectives, but I’m changing strategy for the actual race. I had hoped to run it at my standard loping pace and complete in sub-5 hours. But in my longest training runs, I either wrung myself out or hit an impermeable wall at 20-21 miles. The furthest distance I’ve completed is 21 miles. Therefore, I’m going to walk some in the race and plan to stretch and walk at least 5-10 minutes every hour. A colleague reminds me that if I don’t push myself to the wall, I can finish the last few miles in a walk. Better to do that than to not finish. Wish I had a couple weeks here to try the new strategy first. Also, I’m going to carry and eat a bunch of food. In addition to my standard fare of quartered oranges, I’ll carry some runners jelly-tabs, and some protein-heavy trail mix. I won’t have to carry a water bottle, so I’ll have some additional carrying capacity. I will have to bring some disposable clothes due to the predicted low-30’s temperatures. Several have recommended large hefty bags. I’m not even kidding. Thanks everyone for the advice and encouragement. I can see the finish line. I’ll be de-emphasizing my twice weekly weight training at the Y, and bike rides. And as the distances get longer, I won’t be able to complete them on weekday mornings, so the long runs will begin to cut into weekend fishing time! BTW: completed 11 mile bike ride to work this AM, saw two gators on the way. Here is a transcendent piece of simple animation, created by a runner, and supported by Nike. Very nice. 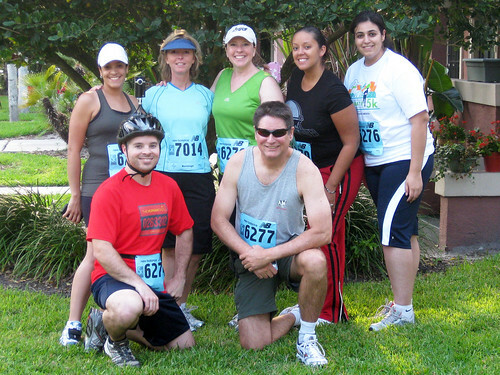 I joined an impromptu team from work to run this 12,000 person 5K downtown last week thursday. It was so crowded it took me 11 minutes to get to the starting line, and I spent almost the entire distance dodging and weaving. The other guy running with us taped a video flip cam to the top of his bicycle helmet and got some awsome video. Hope to have an edit to share soon.